With the recent player acquisitions for the Los Angeles Lakers, our minds automatically go to the volatility that exists amongst its new players as well. It’s no big surprise that LeBron James has had differences with many of the other newly acquired players— conflicts that exist from huge egos competing against each other, rival teams battling it out to reign supreme, or personal jabs meant to get under each other’s’ skin. To say that there will be just a little tension in the locker room next season would be a monumental understatement. Another glaring concern is keeping these larger than life egos in check to respect the hierarchy in the Lakers organization. At the forefront of this thought is LeBron James, who was drafted first in 2003, ahead of now coach, Luke Walton, who was 32nd picked (in the second round). Based on preliminary conversations and information from reps on both sides, there has been warmth shown. Often magical performances stem from a deep-rooted respect and there’s much speculation as to whether James will be able to truly humble himself under someone who was once considered his peer. Only time will tell, it seems. Previously mentioned comments by commentators, political juggernauts, layman and businessmen alike leave a bitter taste in my mouth. While athletes are supremely gifted professionals in their field, they are not just paid to “shut up and dribble.” They are icons, role models, entrepreneurs, advocates and humanitarians. There is no one I can think of who embodies this notion more than the Lakers President of Operations: Magic Johnson. He didn’t just stay in his lane or just play basketball. It would be offensive to say he just played basketball. He’s a philanthropist, an advocate, a businessman; he has been part owner of the Dodgers and the Sparks and is now (as previously mentioned) President of Operations for the Lakers, to name just a few of his accolades. He IS basketball. And he is what the Lakers need to look to for motivation, public relations, humility, reinvention and inspiration. He has brought together a Masters Team. He has brought the magic, which makes his name so aptly fitting. He seems to have his work cut out for him for the 2018/19 season with all the egos showing up in the Lakers locker room. One thing that egos don’t have room for is other egos. 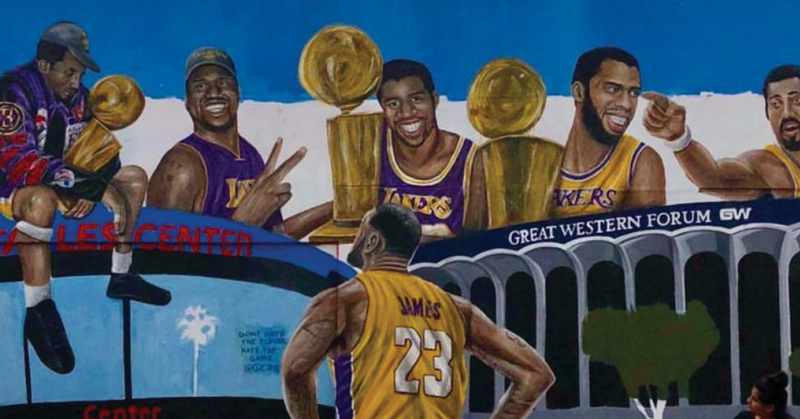 The new Lakers team consists of some of the largest egos there are in the sport, not to mention that the rivalries are some of the deepest, most personal, most exploited and juiciest in the media right now. The LA Lakers have a few things they need to remember. They are not just athletes, they are role models to kids everywhere who idolize them. These kids look up to them, want to be them, want to meet them, if only for a second. Kids whose dreams are born from watching these basketball giants dominate and surpass their own dreams, beyond their wildest fantasies. These players are paid obscene amounts of money not just to play, but to entertain, uplift, breed ideas and dreams for our youth, to pour their passions into programs that facilitate kids getting to where their idols are now. They need to remember that theirs is a responsibility not to the sport, but to the youth of America and abroad to spawn new talent, new dreams, new passions, and new giants who will come up and take their place someday. The Lakers also need to remember that they represent us, the City of Los Angeles. We are a center for socialization, education and exploitation, but also a place where innumerable dreams are born, realized and achieved. Los Angeles is a melting pot only because of the opportunities that Los Angeles, uniquely has to offer. They might not know it yet, but the LA Lakers, in this team-defining moment, might be mirroring the political upheaval that exists in our society today. There is no doubt that as a country, we are divided. People are openly spewing hate and exhibiting hypocrisy while party lines are moving further and further apart, polarizing and isolating communities. My hope is that the Lakers will seamlessly overcome their differences, their personal conflicts and their rivalries for the good of the team, but beyond that, for the good of the city, and maybe even the country. If we can look to them, to put their personal egos aside, maybe, just maybe, we can realize that anything is possible. If LeBron James and Lance Stephenson can focus their energies on supporting each other, on putting aside whatever has happened between them in the past and make the Lakers a united and even more iconic team, then maybe we, who look to them for inspiration and entertainment, will be able bridge the gap between our own rivalries. If The Lakers are able to embrace a former rival, like Rajon Rondo, and utilize his skill set, vast history in the sport, and past successes, then maybe it sets an example for this country. To unite The Red and The Blue and meet somewhere in the middle; maybe mixing and blending to become the purple that is so iconic to the Lakers jersey, all in the name of basketball. Are they capable? Can they do it? Are they the role models and icons that we have always set them up to be? I think they are. I think they can. I think they can overcome it. I think all these titans, at an early age, learned the importance of “team”, and learned that there is no room for “i” there, no matter how big that “i” is, or how much money he makes, how many awards he wins, or how many championships he makes it to. The same is true for us, America. We are only as good as our LVP (Least Valuable Player). So, if all of our players are the best of the best, then the worst can’t be that bad. The Lakers need to remember that their team is larger, more important and more iconic than any one individual player will ever be. The team was a championship team before them, and it will be after them. Their legacy lies in the team spirit that they exhibit and inspire while they play here. They must embrace the experience— appreciate the Lakers, and what they have to offer this iconic team, and vice versa. Their legacy is also to represent our fair city and I hope they realize that. They are meant to mix and mesh so there is no ‘LeBron James’ or ‘Rajon Rondo’ or ‘Javale McGee’, instead, they are just ‘The Lakers’. Similarly, we, as a city, have to remember that we are not just the individual person. We are a beautiful, vast, diverse city that has so many valuable contributors, and we wouldn’t be what we are if it wasn’t for every single one of us. The Lakers are the same. For as amazing and huge as some of these players may be, they cannot be a team all by themselves. They must humble themselves, listen, work together, and take direction. They must utilize and exploit their similarities as well as their differences. They must be the team we all dream them to be. This year is a team building year, but all the best teams need those critical building moments to become the iconic and historic teams they are meant to be. We believe in you, Lakers. We believe in what you represent individually, in your talents and your gifts, your heart and your unity. We believe in you as ambassadors for our beloved city. Stand united, and we will stand behind you, cheering. Represent Los Angeles as we know you can, and we will do our part in uniting ourselves behind you, following your lead. Have an amazing season and we can’t wait to see what monumental moments you will whip out for us this year.